The Model 1800™ Knee CPM provides effective continuous passive motion therapy to post-operative or injured knee. With an open carriage design and ability to accommodate adult and pediatric (petite) patients, the Model 1800™ is versatile and provides a proper anatomical fit. The analog dial control pendant is simple to program and allows staff and patients to change settings easily. Sturdy, mild steel construction, lightweight design and overall functionality make the Model 1800™ ideal for hospital and home environments. Unique lift and bend motion provides proper anatomical fit, accurate range of motion and ultimate comfort for CPM patients. 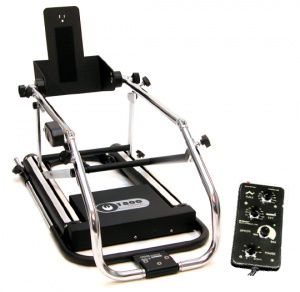 Axis to axis motion, skid pad and bed stabilizing system prevents migration ensuring a precise fit. The hand-held control pendant features a classic analog (turn dial) design easily understood by hospital staff and patients. Unique tripod position reduces contamination and offers a convenient storage option. Quick conversion from adult to pediatric. Units can be set up easily and quickly for conversion without the need for additional accessories. © 2012 The Furniss Corporation Ltd. World Rights Reserved.